What's New: Dior, Peter Thomas Roth and Chosungah 22 | Top Beauty Blog in the Philippines covering Makeup Reviews, Swatches, Skincare and More! An invisible revolutionary skin shield, skincare-inspired hair treatment and a two-in-one lip tint and gloss for vivid and glamorous lips; all available now! DIOR ONE ESSENTIAL CITY DEFENSE SPF 50 - Thanks to a triple anti-pollution action — anti-adhesion, anti-penetration, and anti-oxidization — and powerful UVA/UVB filters, your skin is protected for up to eight hours. It works great as a makeup base, refreshes skin, and delivers youthful-looking radiance. 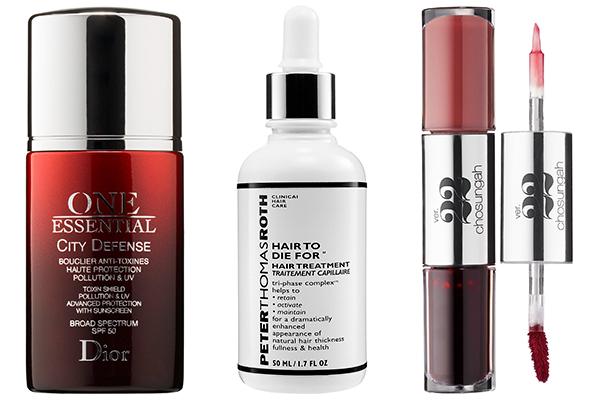 PETER THOMAS ROTH HAIR TO DIE FOR TREATMENT - This hair treatment contains unique Tri-Phase Complex which targets all three stages of the hair growth cycle. Designed for thinning and lifeless hair, along with damaged hair due to age, over-processing, hormonal changes, stress, and more, it works to retain, activate, and maintain healthy, lustrous hair. CHOSUNGAH 22 DUAL LIP TINT & GLOSS - This dual tint and gloss features a color that expresses vibrant color, and a lip gloss that leaves the lips hydrated. The long-lasting gel-based tint offers two different shades of rich, bold color. Infused with soothing cupuaçu butter, the gloss moisturizes and volumizes lips—even while on the go. Interesting products, all worth a try! Great, darling, I simply love Dior!